Walnuts with honey is not only tasty treat, but also an excellent medicine for colds, coughs, headaches, cardiovascular diseases and diseases of the gastrointestinal tract. But should not as a dessert, but as a cure - 2-3 teaspoons a day. Each product separately,as the honey, and walnuts, has many beneficial properties. A Mature walnut is rich in vitamins A, E, PP, K, D, B1, B2, B5, B6, B9), amino acids (20), trace minerals, essential oils, tannins, fiber. Of all plant-based products in them, most of the omega-3 and omega-6, and green unripe fruit is rich in iodine and vitamin C. For the health enough to eat only 5-7 nuts on a daily basis, but for medicinal purposes they are often combined with honey. Perhaps there is no need to talk about the value of honey, which in this case plays a very important role of the conductor. It is proven that honey helps to communicate to every cell of the body benefits inherent in walnuts. Besides, it increases the effects of nuts is through the enrichment of its useful properties. For all its benefits, walnuts are difficult to digest. No wonder there are limits to the amount of use. Any excess can instead use to cause poor metabolism and digestion. Honey, in turn, activates the metabolism and stimulates the activity of the gastrointestinal tract. Dutch scientists have observed thousands of women and their children from pregnancy until children reach 8 years of age and found that those mothers who were abused during the period of gestation nuts, gave birth to offspring that are predisposed to asthma. But when nuts are intelligently combined with fresh, dried fruit and honey, this danger is averted. Another reason for the use of walnuts with honey – the first is the ability to rapidly deteriorate in a purified form. Long-term storage is possible only at low temperatures or with the participation of the honey. Honey as a sterile product disinfects nuts, holds, without changing their useful part. Honey nuts can be stored for a long period of time, it is not recommended to eat per day more than 2-3 teaspoons. It is better not to stretch the pleasure for the whole day and eat in the morning is as full of Breakfast as the dish is fairly high in calories. Experts say that honey with nuts is a kind of viagra, enhancing sexual function of men, particularly if used chestnut honey. In the treatment of prostatitis and enhance potency of this drug should be consumed at least a month, but you can eat every day, until you get bored. 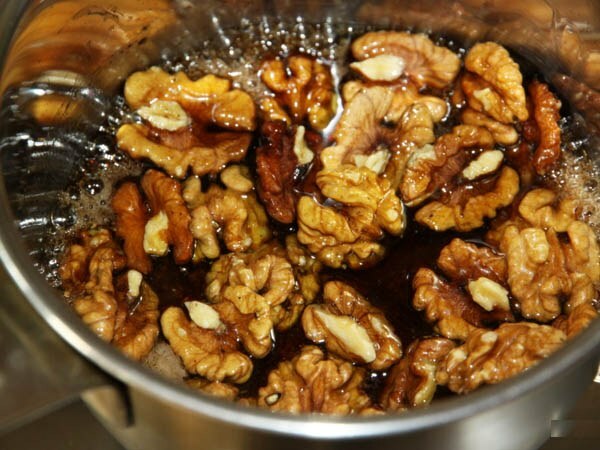 Walnuts with honey are beneficial for a work of cerebral circulation, improving memory and intelligence. Hyperactive children can be useful as a sedative and a tonic. To cleanse the liver, intestines, to get rid of parasites, you can use the juice of green walnuts, mixed with honey. One should take 1 teaspoon 3-4 times before eating. Green walnut with honey is useful in anemia, fatigue. Widely used walnut with honey for cardiovascular diseases because it contains a lot of potassium. It is used as a means for the prevention and treatment of atherosclerosis. Stress and insomnia, headache, diabetes, diseases of the respiratory tract, gastrointestinal tract, recovery after a serious illness – this is not the whole list of illnesses in which treatment help two powerful tools of nature. Nuts with honey - delicious Oriental sweet, not only very nutritious and perfectly satisfy hunger, but also very useful. It contains important minerals and vitamins, so necessary to the human body. In addition, honey is a good preservative, and therefore, nuts with honey can be stored for a very long time. Excessive consumption of sugar is very harmful to your health – as evidenced by all the doctors. Therefore, its use in food should be seriously reduced. Fortunately, sugar is a great replacement that not only does not harm the body, but, on the contrary, great benefit. Of course, talking about honey. In addition to the rich, sweet taste of honey has sugar lot of other benefits. It contains vitamins and minerals needed by the human body. 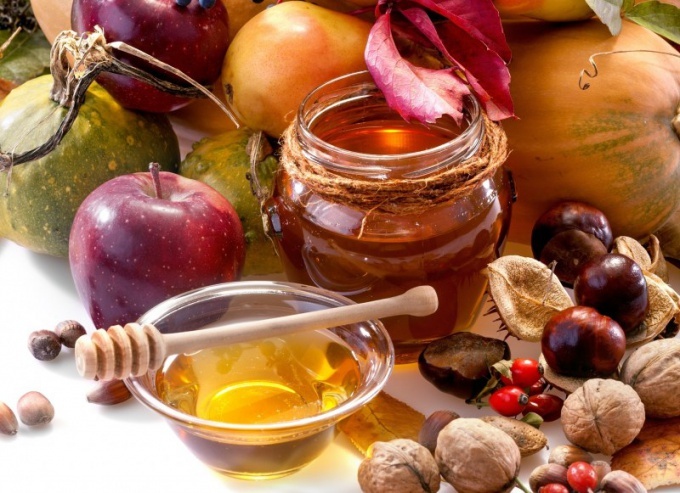 Especially healthy and tasty honey in combination with nuts. This dainty heals the body and is an excellent replacement for sweets and chocolates. Why is it so helpful honey with nuts? The composition of honey contains B vitamins (B2 and B6), folic acid, magnesium, iron, potassium, iodine and many other useful items. It is very nutritious and is ideal if you need to quickly restore power. Due to the antibacterial action, he will not be spoiled nuts for a long time, and the treat will delight the sweet tooth for a year or more. Plus, the honey strengthens the nervous system, reduces the impact of stress on the body and protects a person from infectious diseases. Now about nuts. First of all, nuts are a source of unsaturated fatty acids, which are considered to be much more useful than animal fats. Almost all nuts have a positive effect on brain activity, lower cholesterol and improve the cardiovascular system. To honey with nuts brought maximum benefit, all the products you need to choose. First, and honey, and nuts are best to buy in a reliable and proven. Second, the nuts should be clean, without dark or white spots on the surface. Thirdly, when choosing honey, you need to pay attention to the smell. In this honey, strong bright flavor, whereas sugar diluted with saturated smell it has. Fourth, quality nuts to taste have a bitter taste without bitterness. Fifth, ask about the "age" of nuts. The fruits, which are more than three years, is no longer available. Prepare a mixture of honey and nuts is quite easy. Nuts need to be put in a glass jar whole, without slicing into pieces. Then pour the honey on, tightly close the jar lid. Store the mixture should be refrigerated always tightly closed. Use honey with nuts best, every day, at least one teaspoon. Can be with tea or any other drink, just like that. But do not abuse treat, it is fraught with overweight, because the honey and nuts are very high in calories. Also better to find out if allergies are part of the mix that is use to harm themselves.